Our core aim is to provide you with an excellent service in all categories of property management and sales. The current proprietor Hebert Montgomery has over 50 years of property and legal experience and is privileged to have an excellent team with a wide breadth of experience in all aspects of the property market. We know there is no substitute for experience, we have this in abundance and look forward to managing your investment. Excellent estate agent. Repairs generally carried out promptly. High quality apartments. And very helpful: I left my keys inside my place on a Saturday evening, and a member of staff took time out of his personal schedule to let me in. Not only that, but he was extremely courteous, friendly and funny. Unbelievably good customer service. Highly recommended. Couldn’t possibly rate this Estate Agent any higher (From the perspective of a tenant). Right from the get go my partner and I felt very welcome to the agency. Our agent Matthew, was very considerate of our requirements and arranged viewings for us in properties that could not have been more perfectly suited. We were given our own space to view the properties and any questions we had were answered in full. The application process was straightforward and the agency couldn’t possibly have helped any more, the application forms come with all the details you could possibly need. The response time for questions was great. Anytime my partner and I had questions they were answered within such a short space of time. We’ve dealt with a lot of agency’s throughout our lives but none compare with the service we received with Montgomery & McCleery and I could not recommend them high enough. Top class at renting and managing my property and at selling our house in Derry. Ben had up-to-date ideas about marketing the property and Lynn even to came to our home and help us to declutter, [we put a lot of our things into storage, and painted several rooms]. 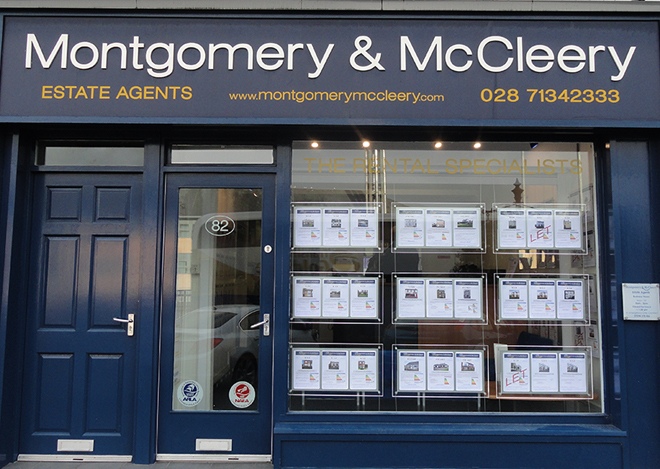 I owned, and was resident in a property until a few years ago and when my personal circumstances changed I decided to rent out my home ;I was recommended to use Montgomery and McCleery as my letting agent. I just wanted to take this opportunity to convey my appreciation ( having recently installed a new tenant , on my behalf) ; their levels of service, communications and efficient, helpful approach have been exemplary and I am deeply grateful. I have largely dealt with Lynn ( and found her to be fantastic) but have had occasion to deal, and liaise with, other members of the team. Their very professional, helpful and efficient work is deeply appreciated; all my dealings with the staff thus far have been very positive. I understand the heavy workload they have but it is really impressive that they manage to deal with cases such as mine with prompt, individual personal attention. Keep up the great work; I really can't over estimate the superlative work this team do! With thanks for all you do on behalf of property owners such as myself.